The reboot/remake/reimagining of Ghostbusters has gotten much criticism, some of it quite harsh and almost vitriolic, over the fact that the leads are played by four women. I've opted out of commenting over this because frankly it is irrelevant whether the leads are women or men (or at least to me, it should be). If I objected to anything involving Ghostbusters, it is on the idea of remaking a beloved film, period. What is the point of making a movie that already has stood the test of time thirty years-plus later? Now we have the film itself to judge, which is what we should be judging. After all the controversy, after all the denouncing and praising, we at last get to see what the people behind Ghostbusters wanted to show us. After seeing it, what they wanted to show us is that they have made a terrible, unfunny film, wasting almost everyone's talents and deciding that they were going to make those who remember the original dislike it more, and those who don't forget it just as quickly. On the verge of getting tenure at Columbia University, Dr. Erin Gilbert (Kristen Wiig) is horrified to discover that an old book she co-authored about the paranormal, in particular the book's arguments that ghosts were not only real, but scientific, has resurfaced. It's resurfaced thanks to her former BFF Abby Yates (Melissa McCarthy), who needs book revenue to fund her own ghost-hunting. Erin goes to Abby and begs her to take the book down, and she angry agrees, provided Erin take her to the Aldridge Mansion, a New York museum where the curator has turned to Erin for help in investigating a potential ghost. Investigating it with Abby and Abby's protégé Jillian Holtzmann (Kate McKinnon), they find ghosts are real...and Columbia fires Erin when video of her reawakened enthusiasm appears on YouTube. Anyhoo, Erin and Abby decide to mend fences and join forces, along with Holtzmann, to open up a paranormal investigative enterprise. Working for them is Kevin (Chris Hemsworth), a very hunky man who is their new receptionist and whom Erin is openly gaga over, a little beyond to where her actions make her look both desperate and might qualify as sexual harassment. Fortunately for her and them, Kevin is beyond stupid. Examples of his stupidity are that while he wears spectacles, he took the lenses off because in his words, "they kept getting dirty", and who covers his eyes whenever he hears loud sounds, one of which isn't the telephone because despite it ringing loudly he never hears it, let alone thinks of answering it. It has to be explained to him that the telephone in the fish-tank (which he calls "a submarine for fish") is not the actual phone, but a decorative piece. Yes, he IS that dumb. Then again, Hemsworth himself might be a 'decorative piece' in real life too. Also entering into this world is walking stereotype Patty Tolan (Leslie Jones), an MTA worker who knows the city inside and out. She's also had a spectral encounter of the third kind, instigated by the actions of an overtly weird man named Rowan (Neil Casey), who is bringing out the dead as a way to get revenge for being bullied all his life. We know this because he tells us that in rambling monologues. Well, the four of them now use their various skills to keep investigating, and manage to capture a ghost at a death metal concert (complete with Ozzy Osbourne cameo...about the sanest thing he's done recently). There are debunkers after them, the Mayor (Andy Garcia) and Homeland Security are giving them fits and beg them to keep doing their work (while constantly harassing them publicly NOT to), and after tracking Rowan down, he appears to kill himself. I say 'appears' because his death is all part of his plan to unleash the Apocalypse on humanity. As part of this plan, it means taking over someone's body: first Abby, then that hunk of man Kevin. Kevin/Rowan now open a portal where all the malevolent spirits go on a rampage, and only the Ghostbusters will be able to stop the insanity. It requires one of Holzmann's newest devices to close the portal, and in the end, the Ghostbusters are victorious, and more importantly, beloved. There is simply so much wrong with Ghostbusters, starting with the fact that it isn't funny. 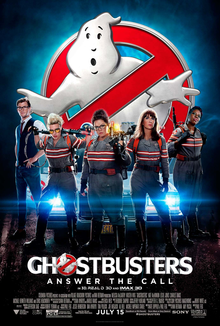 I know the audience in the theater was laughing at bits I found shockingly idiotic (example, the spectacle over Kevin's spectacles), but right from the get-go Ghostbusters seems determined to show how cowriters Katie Dippold and director Paul Feig are trying too hard to make things hilarious. At the opening, when we're taking the house tour, the tour guide comments on how the home had all the latest security systems for the times, up to "an anti-Irish security fence". He goes on to add how in a particular room, the owner and his allies created the idea to 'enslave elephants'. I figure Feig and Dippold thought this was witty, but the guide said it with such a straight face that it left me more puzzled than laughing. Do they not realize that such things just sound odd? The tourists don't react to hearing such bizarre things, which makes it even more odd. Same goes for when the Ghostbusters are at the rock concert. There is this gigantic, demonic-looking thing, and the concertgoers seem thrilled to have apparently summoned Lucifer himself (or as Dr. Ben Carson would say, Hillary Clinton). The demon throws the lead singer into an on-stage display which crashed on top of him, but at the end of this scene, he's back on stage, no scratches, singing with great gusto. Again and again Ghostbusters doesn't seem like an actual movie, just a series of bits tied together by having the same people appear in them. It just seemed again and again that Ghostbusters wanted real bad to be funny, to dare I say, match the level of humor in the original, but trying too hard to force the humor (like a running bit involving Abby's bad delivery of Chinese takeaway where McCarthy I think, or hope, tried to make funny but was so dull). As I watched Ghostbusters though, I wandered back to the sexism controversy. I thought, 'would it be funnier with men?' My answer is a simple, straightforward, "No". The problem is not with the cast, whom I figure are good at their job as comediennes. The clear standout was McKinnon as Holzmann, because she at least had something to do and latched onto her gonzo character all guns blazing. Every time she was on screen, her wild and crazy girl with brains was, if not always funny, at least interesting to watch. That's what made her one serious moment all the more touching. Which is more than I can say about the other three ladies. Jones was probably the one who suffered the most, coming close to being a stereotype. Unlike the other ladies, Jones' Patty did not have advanced education, was at a lower-end job, wore large earrings, and as the trailer points out, was not body-surfed at the concert (whether it was a race thing or a lady thing we never learned). I wondered to myself, 'why couldn't she be just as academically-inclined as the rest of them'? Couldn't she have been a historian or at least an enthusiast of history? In short, why was she somehow good enough only for some wisecracks and bringing the hearse? Though to be fair, her The Shining comments did make me laugh...one of the few times I did. Another problem is that Ghostbusters wants to have it both ways when it comes to having the four female leads: empower them and weaken them simultaneously. Take Wiig's Erin for example. She's suppose to be a bit uptight but highly intelligent, though not apparently a linguist. Erin says softly that 'Mercado', the name of the hotel at the center of the portal, is Spanish for 'table'. It isn't: 'mercado' is Spanish for 'market', and 'mesa' is Spanish for 'table'. I digress here to wonder what the point of that comment was. It was spoken too softly to sound like it was a gag, and it makes Erin look almost stupid for a bright person. I simply don't get it. In any case, you have a character who is suppose to be brilliant at the same time so openly lust after Kevin and go out of her way to make the himbo pay her the slightest attention in a romantic or sexual way. I keep hearing about how great it is to have four women little girls can look up to, but I also see how one of the two female lead characters seems perpetually flustered and even hesitant about her inability to get any attention from the guy who's referred to as 'a flying beefcake' when he's about to take over the world. As a side note, if Kevin had been a woman and Erin a man, would her perpetually smitten attitude towards her be considered funny or sexist? You be the judge. 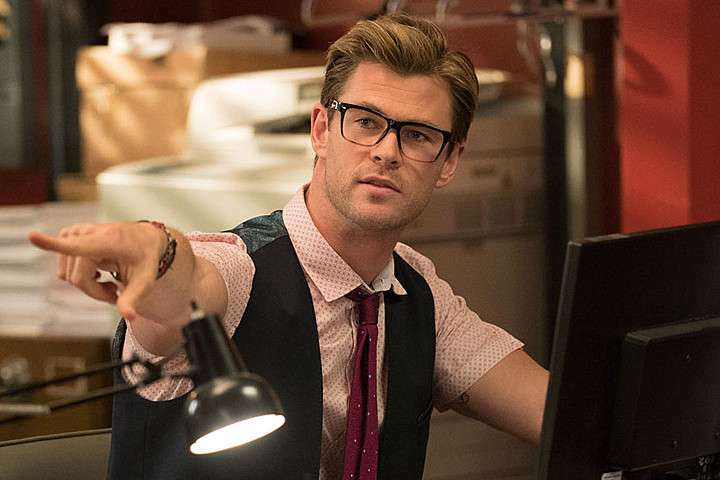 Speaking of Hemsworth, I keep hearing how great he is in Ghostbusters, what a breakthrough it is for Thor, how hilarious he is. Are we talking about the same person who has never been able to lose his Australian accent even when playing ostensibly American characters? He isn't funny because a.) the material isn't funny and b.) he has never shown the talent to make things believable, let alone funny. Sure, Kevin is dumb as a rock and weighs as much (according to McCarthy), but no one could be as dumb as Kevin and still function. I'd like to point out something Ghostbusters never answers (or at least I don't think it did). Kevin wears frames but took the lenses off them 'because they kept getting dirty'. If he does actually need lenses to see, how exactly can he see clearly without the lenses? Maybe contacts (assuming he can figure out they go in his eyes, not his ears)? If he can see clearly without them (which he appears he can), why does he even need the frames to begin with? You take over the world and the only thing you, bullied figure that you are, can think of doing is having a flash mob? A film that has the villain (poorly defined as he was) literally tell us his plans and his reasons for is bad. A film that does all that and never gives us any reason to care about either how he got to this state or those who team up to stop him is worse. Oh, I haven't mentioned McCarthy. From my vantage point, I think she's pretty much spent all the goodwill she built up with Bridesmaids with this and the more appalling The Boss. You can only mug for the camera for so long, only deliver lines in a pretty flat way, before people wonder whether you are really funny. I know McCarthy can be, so it's all the more frustrating to see her talent squandered. Abby comes across as slightly unpleasant, even dumb, and while I grant she got better as the story progressed I still didn't think she was brilliant or wacky. She was just there. The cameos from all the surviving original Ghostbusters castmembers (save for Rick Moranis, who declined to appear) all worked well and didn't get in the way of the proceedings. That doesn't mean Ghostbusters 2016 will ever top Ghostbusters 1984 or be as beloved and/or remembered. It just means that Ghostbusters 2016 will be an example of the remake-mania that swept Hollywood this year, up there with The Jungle Book, The Magnificent Seven, and Ben-Hur. Just because a film already exists doesn't mean a remake is automatically bad. However, it does not mean that the remake is either an improvement or even necessary either. Except for McKinnon, the cast is wasted. The story lurches in fits and starts, with scenes dragging to have more 'humor' that falls flatter than Chris Hemsworth's abs. The set-up for a sequel is simply a sign of the dearth of ideas in Hollywood and a desperate ploy to keep something that should not have come about going. Remember, everyone loves Ghostbusters. No one likes Ghostbusters II. The problem with Ghostbusters isn't that it has four females taking the place of the four males in the original. The problem with Ghostbusters is that it just is forgettable, dull, and not funny. When I saw you'd reviewed this I started smiling because I knew you'd be honest about it. I enjoyed reading this very much. As far as the controversy, I've actually gone out in search of sexist comments in the vast interwebs, and what I found was just people just predicting exactly what this movie is. People who made news for their "sexist comments" like James Rolfe actually had legit reasons for not wanting the movie to be made. You're right, this movie should be judged for what it is, and sadly it seems like most people are determined to love it just because it's supposedly good for women, but it sounds like it's pretty terrible for women (and everyone) in almost every way. I heard about people supposedly disliking the idea of four female leads taking the place of men. As for me, I don't care whether it was all men, all women, or a mix. Nothing said that the leads had to be either one or the other. I just want a funny movie, which I didn't get, and it wouldn't have been funnier w/men. Exactly, I heard that too, but never found proof to back it up. I think most people are actually in the same boat as you, and me.